Buffalo rising from Blueprint Gaming sees the UK based provider once again utilize the ‘Megaways’ license they acquired from Bit Time Gaming to bring us a slot set on the dusty plains of the wild west where Elks, Wolves, Bears, and the Buffalo roam the prairies, and in this instance, bring in the big wins. This 6 reel slot has varying reel sizes of between 2 to 7 rows on the outside and 2 to 6 rows on the middle four reels, with reel sizes changing with each spin. This creates up to 117,649 ways to win. 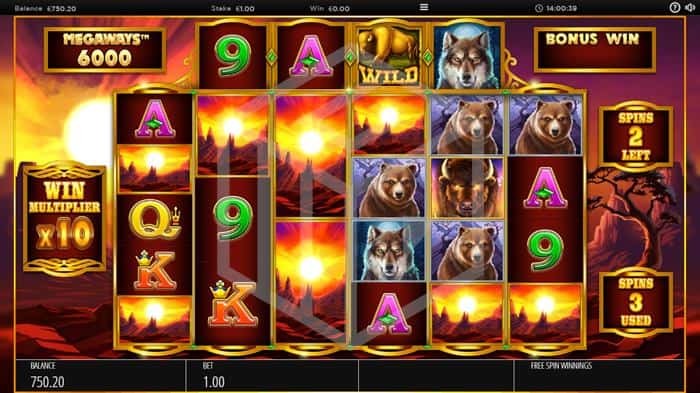 Also, on every win a cascade feature activates whereby all non-winning symbols are replaced by new symbols dropping down from above meaning each win has the potential to increase in size exponentially, especially in the highly lucrative free spins round. Buffalo Rising is a high volatility slot with a decent RTP of 96.5% and with minimum and maximum spin sizes of €0.10 and €10 respectively. The design of Buffalo Rising has the Megaways board set centrally with a backdrop showing the plains of the Wild West with rocky outcrops in the distance beneath the bright blue sky, although the sky will shift from blue to hazy oranges and reds as the sun sets when you enter the free spin round. The lower value symbols are taken by the standard 9, 10, J, Q, K, and A, while the higher paying symbols take the form of some Wild West appropriate animals – namely Elks, Wolves, Grizzly Bears, and of course the Buffalo. The Buffalo is the highest paying of the regular symbols for a full way of 6 symbols with 50x – considerably higher than the next highest payer, The Grizzly Bear where 6 across wins 7.5x. There is also a ‘Mystery Symbol’ which takes the form of a landscape scene. These symbols (they will appear several at a time) will all transform into the same random regular symbol after a spin which may or may not result in a win. The scatter symbol is a shimmering pink diamond, and there is also a wild symbol. The background music is theme appropriate with some tribal percussion and panpipes, your typical roaming the Savannah type soundtrack. A decent design and soundtrack certainly, but nothing out of the ordinary here. Buffalo Rising’s, major feature is the free spin round which can pay off huge. There is also a ‘Buffalo Bet’ button which allows you to buy straight into the feature. Although in our experience hitting the free spins playing Buffalo Rising is quite a slog, the potential rewards can be well worth it. Not only do you have a LOT of ways to win on the Megaways board, but also with every win you hit during the free spins a multiplier is applied and continues to build throughout the feature. Free spins are activated by hitting 4 or more pink diamonds – for each additional diamond which may have fallen on that spin you are awarded an additional 5 spins. Activating the feature awards 15 spins, BUT you can choose instead to take 10 spins starting with a 10x multiplier, or 5 spins starting with a 15x multiplier. If that still isn’t enough choice for you, you can opt for a ‘Mystery’ number of spins and multipliers. 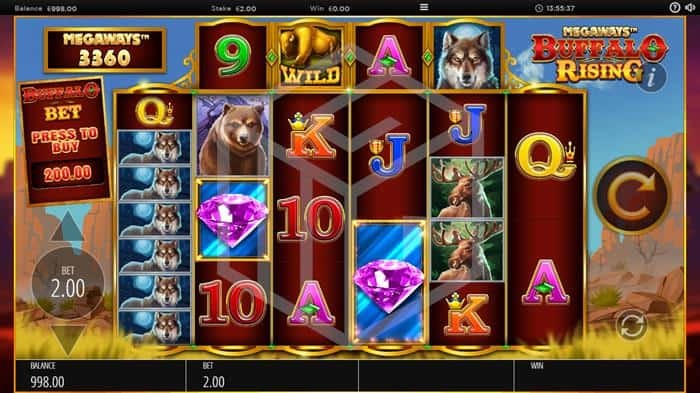 Further free spins can be earned if you hit either 3 or 4 diamonds on the top row which will award 5 or 10 extra spins. If you’re fed up waiting to hit the feature, or just love the action, you can choose to spend 100x your stake whereupon you’ll go straight to the free spin feature. 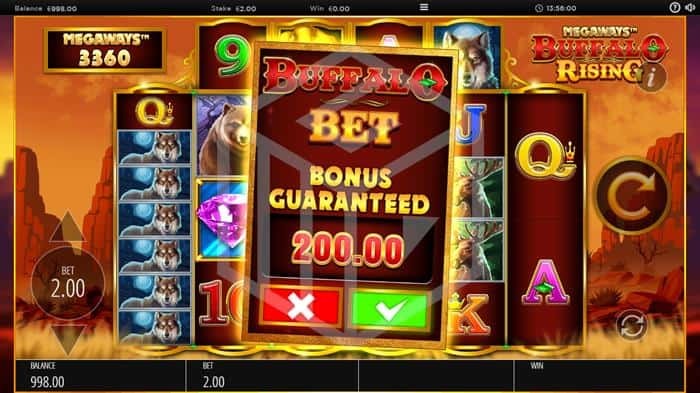 If you’re a fan of the Megaways model then you’re sure to love Buffalo Rising, and with the addition of the ‘Buffalo Bet’ and the option to select the number of free spins and multipliers in the bonus round, it may even convert a few of those who weren’t too keen on the Megaways innovation. The design and symbols are up to the job if not especially innovative or inspiring, but if you’re a high volatility slot fan then this could be the game for you, especially now there is the option to buy straight into the feature.